For every child, a chance to learn. Like hundreds of thousands of children across Syria, Joumana, now 15, was forced to flee her home due to escalating violence. Back in 2012, together with her family, Joumana was uprooted from her village in the countryside of Deir-ez-Zor in northeastern Syria; the beginning of several displacements. Seeking shelter in another nearby village, the family had nowhere to stay but in a school used to shelter displaced families, where they shared a small classroom with four other families. 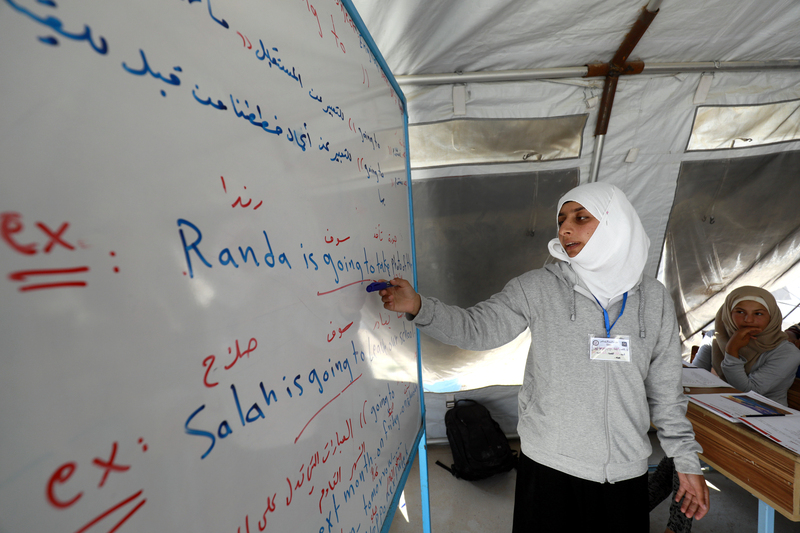 Despite the harsh living conditions, Joumana was determined to continue her learning. Luckily, the school-turned-shelter where they were living had one floor reserved for education, where Joumana was able to continue her education until Grade 6. The family was then forced to flee again from one location to another as violence escalated, finally arriving at Mabrouka, a tented camp in the middle of the desert in northeastern Syria. “Getting our own tent at the camp was a dream come true after having to share our living space with strangers” says Joumana. Years of displacement, fighting and harsh living conditions forced Joumana to miss out over three years of education. Joumana used to spend her time doing housework to help her elderly mother, and taking care of her sister Nabila, who was born with an intellectual disability. “My parents are no longer able to care for Nabila and so I took on the responsibility,” says Joumana. “I feed her, bathe her and read to her,” she adds. While deep down she had not given up on education, her circumstances forced her to put her dreams on hold at such a young age. “Over the past few years, our priority has been to survive,” she adds with wisdom beyond her age. But a glimpse of hope returned into Joumana’s life when five tents were set up by UNICEF at the camp, serving as learning spaces for children. With thanks to, Germany, the EU, Norway and Educate A Child, a global programme of the Education Above All Foundation, UNICEF introduced the self-learning programme, a unique curriculum allowing children who have lost years of education to study with the help of volunteers and catch up with their peers. The programme has helped over 3,000 children in Mabrouka and other collective shelters for displaced families in the area, to restore a sense of normality and structure into their lives. “I could not believe it at first, I could not imagine myself in a classroom!” says Joumana. Joumana took a placement test to assess her level of education, and was placed in Grade 6. “School does not teach us different subjects only, but also the way we should behave and communicate to rebuilt our communities,” she adds.